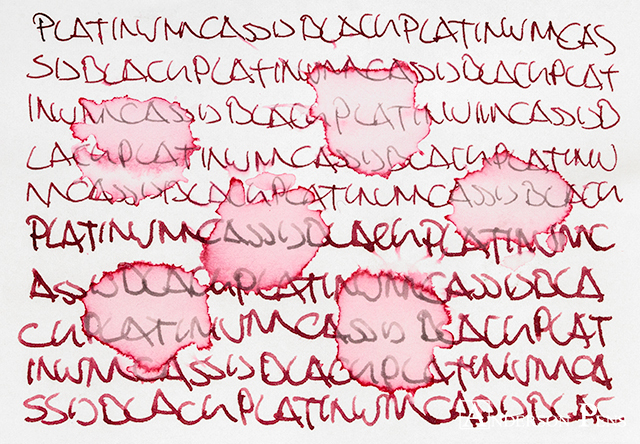 This week we serve up some freshly-picked Platinum Cassis Black. 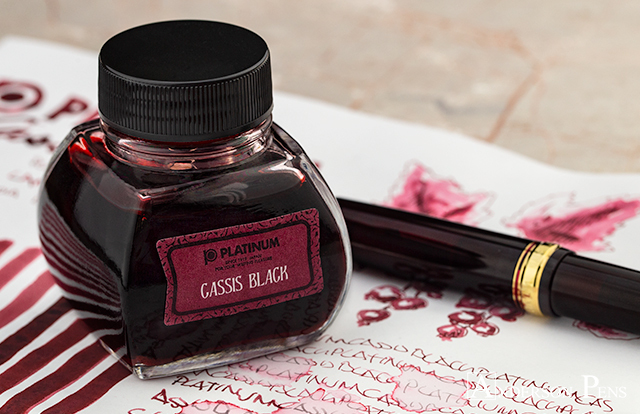 I’m not sure if the name Cassis is referring to black currants or to a wine, but either way it is a good descriptor for this ink. 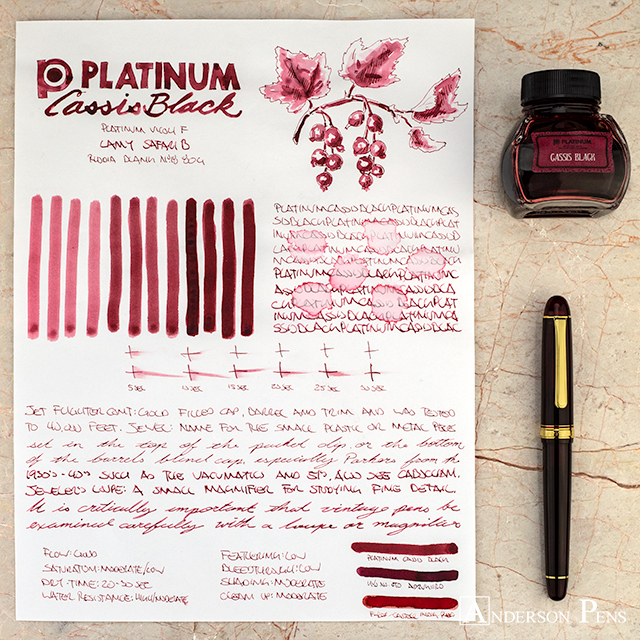 Cassis Black is an iron gall ink, so the color you see on this review will oxidize to a near-black over time. 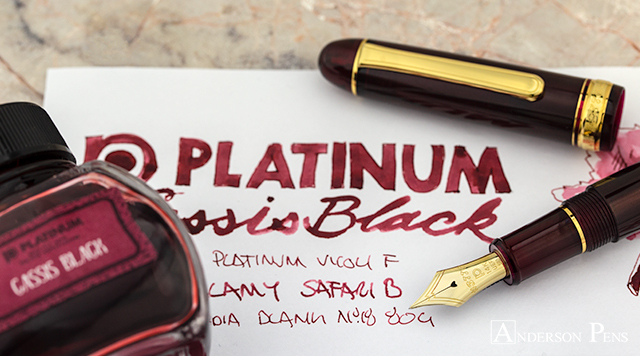 Platinum ink comes in a 60ml squarish glass bottle. There is a plastic filling reservoir to make it easier to get at the very last drops of your ink. 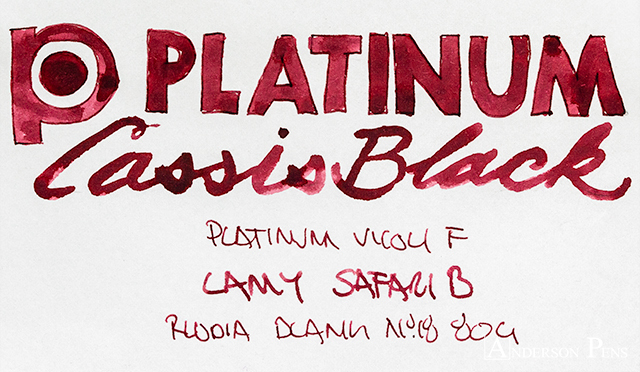 This review was done with a Platinum Vicoh F, Lamy Safari B and on Rhodia blank No.18 paper. 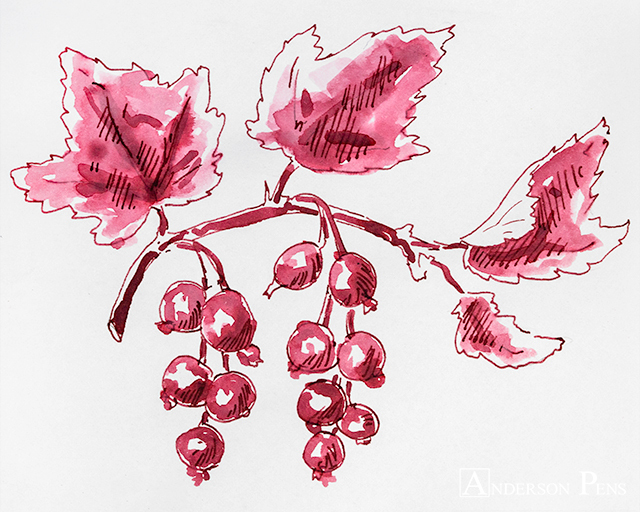 Cassis Black is an iron gall ink and will therefore darken with age. This color description is based on what the ink looks like after a week. 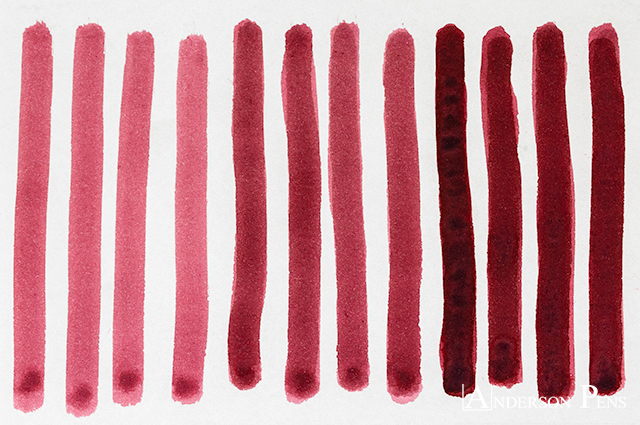 At its lightest, Cassis Black is a blush red. From there, it shades to a brick red and then on to a dark wine garnet color. The ink is very matte in appearance and displays no sheen. I’m pleased with the way Platinum iron gall inks behave. They have good flow, and Cassis Black shows no feathering or bleedthrough. It’s a moderately-saturated ink with a decent amount of shading. 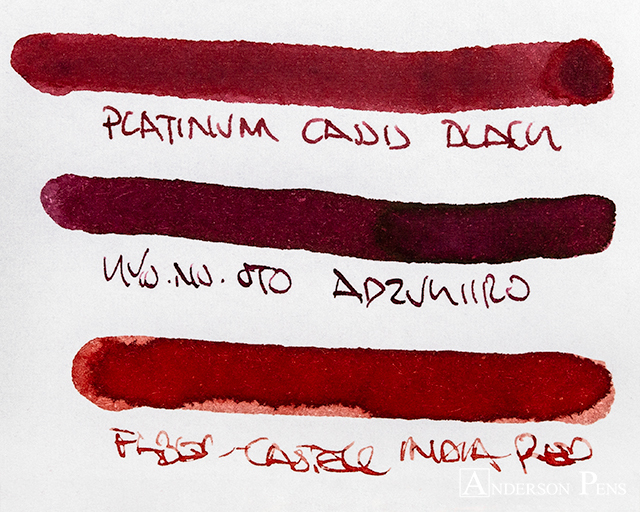 While they are supposed to be waterproof, Platinum iron gall inks are really more water resistant. A layer of pigment gets washed off of the writing, but the base ink is clearly legible. As with any iron gall ink, you’re going to want to clean a pen inked with Cassis Black a little more frequently than usual. It’s hard to find a nicely-colored water resistant ink, and that’s where the Platinum iron gall inks really stand out. Cassis Black is a subtle color that is easy on the eyes. In addition to being a nice color now, you’ll get a completely different color on the page in a year. 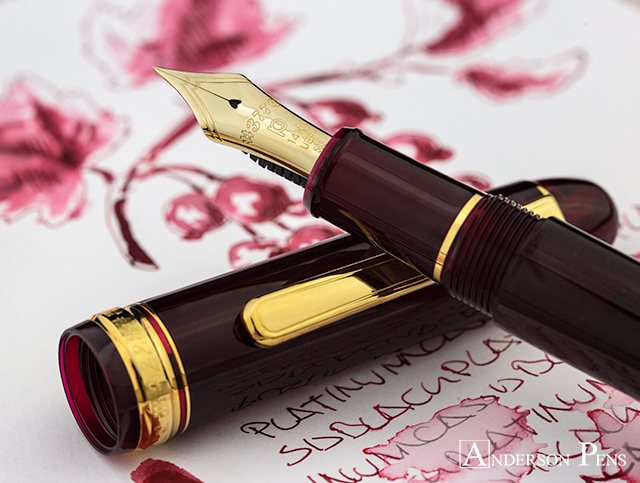 This entry was posted in Ink, Ink Reviews, thINKthursday and tagged ink, ink review, Platinum, thINKthursday. Bookmark the permalink.